The LightScalpel® CO2 laser is a device that produces a concentrated beam of light. The highly focused CO2 laser beam vaporizes, cleanly and precisely, while sealing blood vessels at the same time. 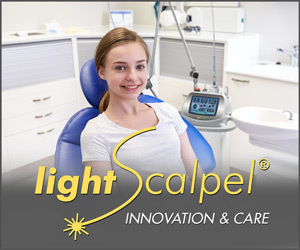 Years of experience in medicine and oral surgery went into the design of the LightScalpel laser, which was made to provide superior care for patients. A laser can perform a wide variety of surgical procedures. Dr. Young will be able to tell you if you are a candidate for laser surgery. Call today to schedule a Consult: Oral Surgery Office of Dr. Steven Young in Johnston RI Phone Number 401-273-7802. You may also use our Contact Us form.